"Didn't you expect something like this?" CJ Entertainment has debuted an official US teaser trailer for Kim Ji-woon's new Korean film The Age of Shadows, which we've mentioned once before when the teaser trailer arrived. The trailer is similar, but more importantly we now know that CJ will release The Age of Shadows in US theaters starting September 23rd - later this month. Which is a very smart move because it means we don't have to wait long to see this. The Age of Shadows is a crime thriller set during the 1920s in Korea, telling a story about the Heroic Corps, an anti-Japanese independence organization that fought back against the Japanese occupation of Korea. The cast features Song Kang-ho, Gong Yoo, and Han Ji-min. This looks damn good. I love the cinematography, and it seems like a gripping thriller. Check it out. Set in the late 1920s, The Age of Shadows follows the cat-and-mouse game that unfolds between a group of resistance fighters led by Gong's character, trying to bring in explosives from Shanghai to destroy key Japanese facilities in Seoul, and Japanese agents trying to stop them. Song plays a talented Korean-born Japanese police officer who was previously in the independence movement himself and is thrown into a dilemma between the demands of his reality and the instinct to support a greater cause. 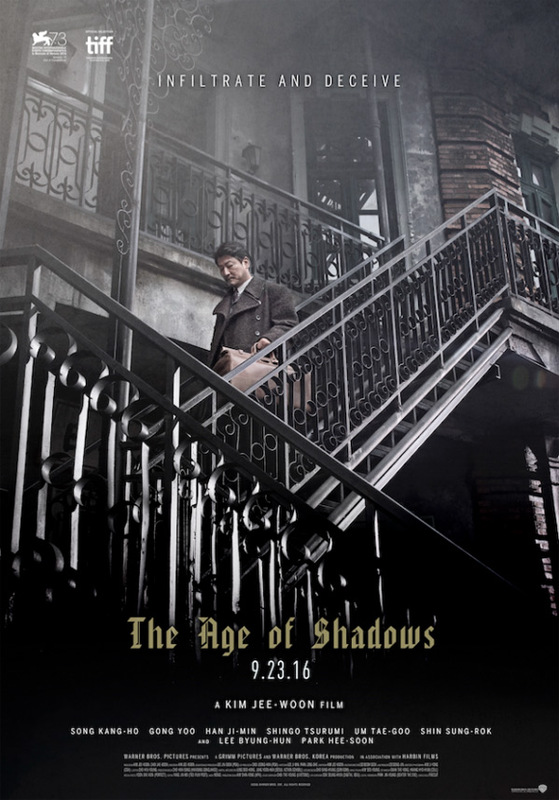 The Age of Shadows is directed by acclaimed Korean filmmaker Kim Ji-woon, of A Tale of Two Sisters, A Bittersweet Life, The Good, the Bad, the Weird, I Saw the Devil and The Last Stand previously. The film premieres at TIFF this week, then opens in US theaters starting on September 23rd later this month. Who's interested? Still looks pretty good. This will slay in SK if it already has not.